Successful organizations concentrate on a few specific precautions identified by data that will focus efforts to prevent injuries and incidents. Measure: Develop a metric of these precautions, develop action plans to improve safety, and manage safety proactively with additional leading indicators. Successful organizations concentrate on a few specific precautions identified by data that will focus efforts to prevent injuries and incidents. Further, they have a process designed around the data to prioritize behaviors from injury data and the collected insights from observations of risk. Without a data-driven action plan process resulting from the insights collected during observations, people get frustrated, participation wanes, and support is lost. The following is a workflow model successfully used in more than 5,000 Lean BBS processes. Once readiness is determined, a team is created (or leveraged if a strong existing one is already present) with representation from each major area and level (sometimes) of the organization. They are taught the basics of BBS and provided examples of other processes to inform their decisions. Incidents are reviewed to determine the variables (e.g., time of day, day of week, work tenure) and precautions to focus on. After a Pareto Analysis is performed, the most important precautions and variables are chosen for the initial focus. Checklists vary in design styles and are often modified after the first few months. The goal is never to try to change the checklist, but rather, with data, to determine whether it needs to change or remain the same. How many observers should you have? Who trains them? Where and when is it best to observe? What triggers the need to observe? What is the observation methodology? These are all common considerations when developing an observation strategy. The strategy must be made to fit the site rather than the site made to fit the observation strategy. Where do people get the observation checklists? What do we do with them when finished? Who enters in the data? How do we enter in the data? Who looks at the data? Who analyzes the data? How can we access the analysis? People do things for a reason. When observations provide insights into the reasons for taking a risk (i.e., differing perceptions, other habits, obstacles and barriers to safe practices), action plans can be created and acted upon to proactively improve safety. This must fit within a data management strategy. Questions should drive action plans in BBS: Is data quantity adequate? Is data quality adequate? Can you prioritize and select a behavior to focus on? Can you identify the influence on concerning behaviors? Is the improvement effort focused on the most important variables? What can the team focus on? What does the team need to ask for help on? Is the effort increasing safe behaviors? Is the effort improving safety? In our experience, the number one reason for "observer burnout," an unfortunate common experience with BBS processes focusing more on numbers than delivering value, is lack of communication and follow-up. BBS focuses on discretionary effort, so it must have a strong marketing and communication plan. What do people need to know, and how and when do they need to get it? Two additional questions will determine your effectiveness: How many people can name the precautions you are focusing on? How many people can name a recent success from the BBS efforts? If the efforts are inefficiently focused, they will become ineffective. 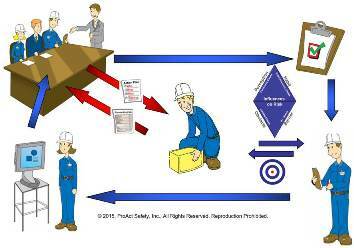 The people involved in the efforts must be seen as customers of the process or disengagement will eventually occur. Are you capturing and delivering value to your BBS customers, and do they see your process is as efficient as it could be? BBS is not an incentive or rewards program, and it is not just about observation and feedback. It is not a tool to blame employees for their actions. People perform based on what influences them; sometimes the influences are within their control, sometimes they are not. Because of this, BBS should be more than a focus on awareness. There should be a strategy that guides the efforts and focuses on the customers of the BBS process. Is your workflow and strategy as efficient as it could be, and do people recognize its success? Or is there more focus on the numbers and going through the motions? This article originally appeared in the December 2015 issue of Occupational Health & Safety.